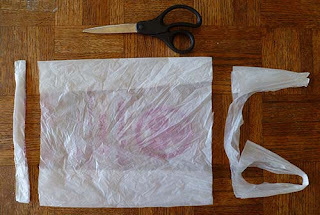 Fusing plastics bags is a really easy and great way to make use of all those extra plastic grocery store bags lying around. All you need is some parchment paper, a few plastic bags, scissors, a towel, and and iron. 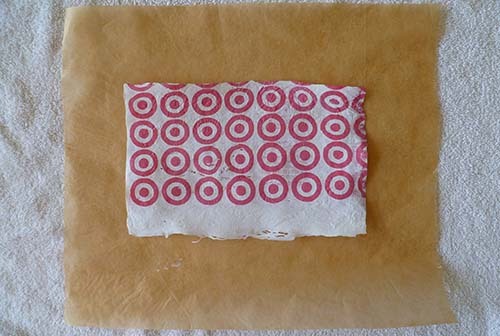 The resulting product has a vinyl-like feel and is perfect for making wallets and even tote bags. 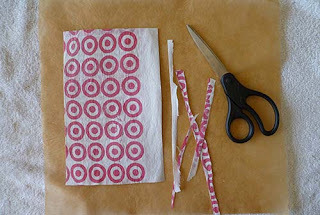 The first step is to flatten out the plastic bag and cut off the bottom and the top handles. Place a large towel down on a flat surface. An ironing board works as well, but this will give you a larger work space. 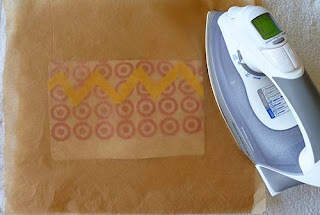 On top of the towel, place a large sheet of parchment paper. 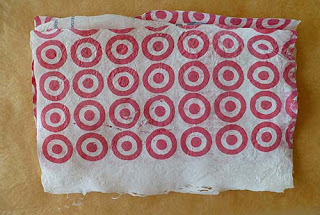 Fold the flattened bag in quarters and place it on top of the parchment paper. Lay another sheet of parchment paper on top of the folded plastic bag. With an iron set to medium or "rayon" setting, firmly and smoothly press down and iron over the plastic bag for about 15-20 seconds. Remove the iron, wait about 10 seconds for the plastic to cool, and check out the fused plastic. It might need to be ironed a little bit more (especially around the edges). If there are holes in the plastic bag, the iron is either too hot or you ironed it too long. This can actually create a cool web-like affect when layered over a different colored sheet of fused plastic. Target bags melt/fuse really easily and create large sheets, hence the change in pictures. Once you have several sheets of fused plastic, repeat the process to fuse them all together. Place the messiest bag in the middle since it won't be seen. Any designed you'd like to be visible should be placed outwards. Depending on thickness, this will take a minute or two to fully fuse. 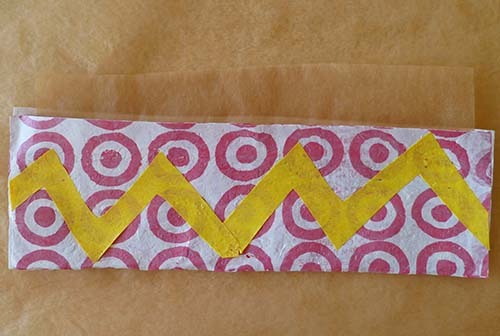 Trim off the uneven edges to create an rectangle. If you want to make a wallet with designs, fuse a plastic bag of a contrasting color and cut shapes out of it. Fuse these shapes onto the rectangle. You will fold the wallet in half and fuse the edges together to create a pouch. To to this, cut a smaller sheet of parchment paper that will fit inside the wallet and will allow only the edges to fuse. 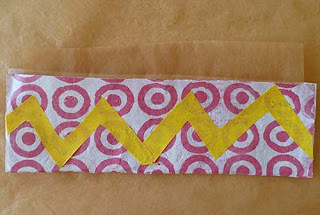 Fold up the wallet and place a piece of parchment paper over the whole project (not pictured). Concentrate on ironing the edges to melt them together. Once it has cooled, the middle sheet of parchment should be easily removed. 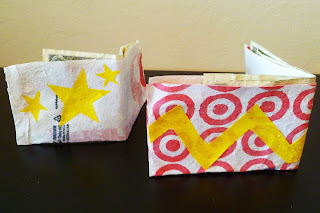 Fold this in half to create a wallet that will fit in your pocket! When ironing the plastic, make sure to work in a well-ventilated area. Keep the windows and doors open! 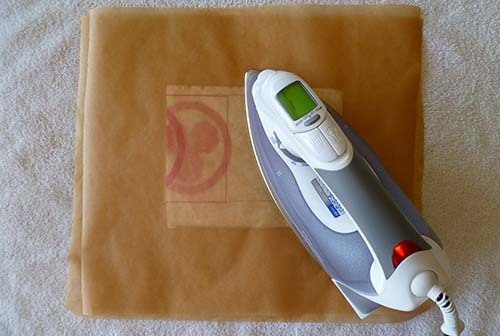 Always iron between parchment paper; otherwise, the plastic will melt onto the iron. Some grocery bags will work better than others. Target and Safeway bags are very easy to work with. 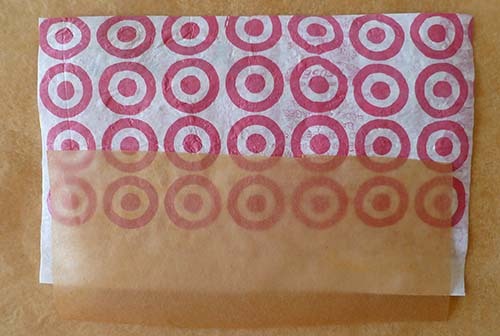 When folding the plastic bag, try to make sure any design is on the inside. Some bags are printed with ink that will melt if ironed on the outside. To be safe, before folding the bags in fourths reverse the bag so it’s inside out. If the wallet won’t stay folded in half, lightly iron the fold for 10 seconds to help it keep its shape. Plastic grocery bags are a great material to fuse because it's thin and strong. When a plastic grocery store bag is stretched in the direction of handles to bottom, the bag feels strong and resilient. When the bag is stretched from side to side, it easily pulls apart and loses ts shape. This is due to the chemical structure of polyethylene, the material that most plastic bags are made of. The polyethylene that makes plastic grocery bags is a polymer. When plastic bags are made, the polymers are all lined up side by side in the same direction. The polymers lay in the direction of handles to bottom. Since grocery bags can be used to carry heavy items, the polymers are aligned this way to give the bags the most strength. Imagine all these tiny chains laying next to each other and holding up the weight of a few cans of food. It’s easy to stretch and deform the bag when it’s pulled from side to side because the chains of polymers are not connected in that direction.